New research on the availability of nutrient-dense wild edibles addresses food security. 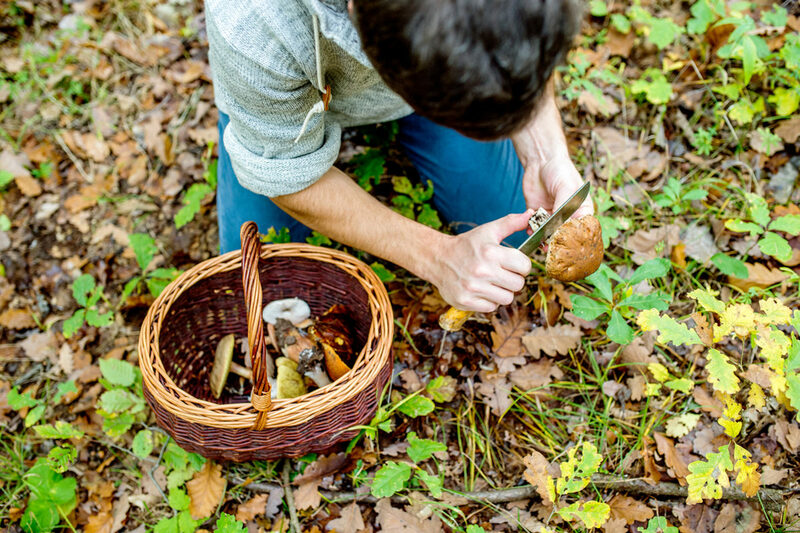 Foraging is a hot trend, with home cooks, chefs, and craft brewers alike harvesting wild, local ingredients ranging from mushrooms and berries to dandelion greens and nettles. Now, a new peer-reviewed study is beginning to explore whether urban foraging can help reduce food insecurity. The study, from the Johns Hopkins Center for a Livable Future and the U.S. Forest Service, surveyed 105 self-identified foragers in Baltimore to understand the motivations of people who seek out parks, forests, residential neighborhoods, and corporate campuses for wild edibles including berries, mushrooms, rose hips, and dandelions. “If foraging is comprising a large fraction of your diet, there may be economic motivations for that,” said Dr. Keeve Nachman, one of the researchers of the study and the director of the food production and public health program at Johns Hopkins. More than half of the foragers cited economic benefits as their main motivation. And foraged foods made up three times more of the diets of Baltimore residents earning less than $40,000 per year than those earning more than $100,000. Moreover, for 10 percent of foragers, wild edibles accounted for 20 percent or more of their diets. Not only are wild edibles widely available and free for the taking—most are nutrient-dense as well. For example, lambsquarters are an excellent source of vitamins B6 and K, folate, and riboflavin; rose hips are rich in vitamin C; and hazelnuts contain protein, fat, and fiber. But factors including cultural norms, potential environmental contamination, and local laws often inhibit the practice’s ability to proliferate. “There are a lot of high-end restaurants and hipsters embracing [edible] weeds, but there are still social and cultural barriers to foraging,” said Philip Stark, associate dean of mathematics and physical sciences at the University of California, Berkeley, and founder of Berkeley Open Source Food. Stark noted that foraging fell out of favor with the rise of industrial agriculture, triggering a belief that food sold in a package or stocked in a supermarket is safe, but food plucked from the soil is icky. Eric Kelly, one of the foragers included in the Johns Hopkins’ study, agrees. Even those interested in foraging often give up upon realizing the amount of education and effort it takes to find and harvest wild edibles. “You have to spend a lot of time learning to identify plants and process them so they don’t taste like bubbling garbage,” he said. Overcoming the “ick” factor is just one roadblock. Nachman also worries about potential chemical exposures from consuming foraged foods, especially those harvested in risky areas. The Urban Forestry and Urban Greening study found that 15 percent of foraging sites were commercial, including industrial and agricultural lands where contaminants are more prevalent. In the next phase of his research, Nachman plans to gather samples from foraging sites across Baltimore and test them for toxic residues. Additionally, harvesting food from public or private lands is often illegal. In 2013, a Chicago Tribune article noted that a 75-year-old man, “barely making it on Social Security,” was fined $75 for picking dandelions to make a salad. The Daily Mail reported that a nurse foraging for mushrooms in the U.K. was ordered to pay £364 in fines and court costs in 2016. For those lacking funds to fill their refrigerators, the possibility of being fined for foraging could be too large of a risk. But Marla R. Emery, research geographer at the U.S. Department of Agriculture Forest Service and co-author of the Baltimore foraging research, notes that policies prohibiting foraging could be ripe for change. Although the Johns Hopkins study doesn’t address the larger issues that drive food insecurity—such as poverty and a lack of affordable housing—the authors do note that their results point the way toward creating urban planning, policy, and design guidelines that can encourage, or at least not criminalize, gathering wild foods. And cities around the country are starting to take action. Seattle recently changed its rules about foraging and, in its 2013 Urban Forest Stewardship Plan, stated that fruit and nut trees and other wild foods provided a valuable food source for residents and that foraging maintains traditions and deepens connections to nature, making it a legitimate use of urban forests. Free-food parks have also been popping up nationwide in recent years. Even as public attitudes and policies are slowly changing, the trend of foraging is raising its profile for profit-making. An interesting study, thank you for sharing with the great write-up Jodi! The demographic info & household income findings are very interesting. Here in Ottawa, Ontario, Canada we've observed similar motivations and do our best to structure our tree & vine harvest events to reduce barriers noted in the research: reducing time commitments to1-2 hours per harvest event and emailing volunteers when there is a harvest event in their immediate neighbourhood (or City ward); training volunteer harvesters on safety, knowledge & harvesting technique for that particular species of tree or vine at the start of each harvest event by our trained Neighbourhood Leaders, and supporting those Neighbourhood Leaders who ID the trees, set up the harvest events in advance and provide required tools & equipment for each harvest. Here in Ottawa we are slowly starting to see public attitudes changing with more and more people enjoying the baby dandelion greens, edible violets and wild mustard green salads from Whole Foods & local Farmers' Markets. However, many of those same people are still paying $250 to $400+ for annual weed control services such as WeedMan ( http://www.weedmancanada.com/services/weed-control ) to remove the same varieties of dandelions, violets and mustard greens from their urban & sub-urban properties. Provincial & Municipal policy here is lagging far behind many of the sates & municipalities mentioned in the research; however, there are some glimmers of hope. Huge investments in infrastructure for organics/composting & weekly door-to-door green bin compost pickup are gladly funded by most taxpayers, in addition our City taxpayers are happy to spend about $5 million/year in different programs/envelopes relating to litter. Challenge now is to shift small amounts of these large infrastructure, maintenance, service & program expenditures to support reduction & reuse -- ie. picking the apple BEFORE it falls, while it is a "resource" rather than wait until it falls and becomes litter or compost. Somewhat challenging now that the huge composting facilities are built and multi-year contracts (with option years) for programs & services already signed. Thanks for providing more info on foraging. I've been leading foraging tours for the public and for private organizations, from teaching farms and schools to birthday parties, throughout the Greater NY area for 37 years, and experimenting with healthful, gourmet foraging recipes for even longer. I've written 5 books on the subject, plus an app. Please check out my site for more info on the subject. Local and wild foods should be the foundation of our diet, not foods from far away that are mostly cultivars, hybrids, or GMOs! So, I couldn't agree more with this article. Local wild plants and animals should be our first line of defense against natural and man-made disasters. Our emergency preparedness plans should rest on wild foods, fibers, and medicines. Thank you so much for this article. I will share it with Philadelphia City Council and many others. I sure would like to see all public parks, green areas and school grounds planted with trees with edible fruits. Perhaps there could also be gardens planted and volunteers would help w/wedding and anyone could pick what they needed. I think churches should be encouraged to plant their grounds with gardens and trees to help their parishioners. Children and adults could both benefit Fermin being reminded where food really comes from. Insm sure others have ideas as well. i grow 100% organic dandelions, mullein, plantain herb in my yard and pick berries, cattails, nuts, fruits as well as cull from dumpsters as food markets, restaurants and bakeries. each bite safe. So I am an aspiring urban forager. Dandelions are all I'm really looking for now but I have a couple questions. 1.) where can I learn more-are there classes I can take or groups I can follow? 2.) How do you know that the food is safe-particularly with "weeds" such as dandelions? I picked these from a nice lady who allowed me to forage from her garden...but...dogs could have peed on them, what if they were sprayed with herbicides, etc? How can you be sure what you're eating is safe?